Erm. 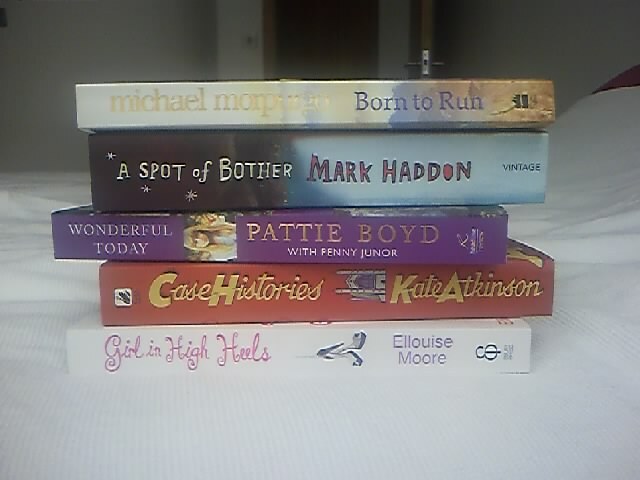 This might be a toss up between Russel Hoban, Kate Atkinson and Bill Bryson. The latter two are neither here nor there but they pump out books and I tend to buy them in those 3 for 2 at Waterstones deals. Actually people buy me Bill Bryson. I know my Mum bought the Thunderbolt kid one – as yet unread. I think George might have bought A Walk in the Woods but I’m fairly sure Notes From a Small Island came from my mad aunty. Woods was my favourite I think and I romanced the idea of wlaking the Appalachan Trail for sometime afterward. I lived on a bit of it for a while too, up on the Blue Ridge in North Carolina which was so beautiful it made me cry several times. I read all the Atkinson books because I loved Behind the Scenes at the Museum, even though I nearly had a nervous breakdown reading it the second time. The first time it was the burning pet shop that upset me and the line ‘the arms of jesus were very full that night’ has stayed with me ever since, so much so that I say it to distressed children (and husbands) quite often..as in ‘dave the goldfish? arms of jesus i’m afraid’. Second time around it was never mind the pet shop but the army dogs that nearly killed me. One of the childhood friends that goes off to WW1 ends up training dogs for the trenches. Apparently there was a national appeal and lots of families donated their pets for the war effort. Many did not survive the training, let alone the trenches being too terrified by the explosions and were destroyed at the kennels. You can imagine what happened to the rest and it echoed All Quiet on the Western Front’s descriptions of the fate of the war horses. That was quite early on. How I got through the rest of the book is beyond me. I gave it to A to read who abandoned and actually said recently to me ‘don’t even mention that bloody book to me!’ (she got me back by giving me Year of Wonder – scarred for life!). Hoban’s books were all bought on purpose by me at full price. I was a bit obsessed with him for a while but the one I liked best was Amarylis Night and Day and I always think of it when I see Edward Hopper paintings or have very vivid dreams. I loved Turtle Diary too and didn’t realise until recently there was a film of it which I really must get around to seeing. Hmm. I know I won two copies each of both The Mouse and His Child and The Dolls House. Just in case. I’ve actually separated the former between maternal and marital homes, should there be an earthquake/fire/flood/act of god. It is my favourite, favourite book of all time and I thank my headmaster’s wife for making it a set text back in II group, many years ago. There was a childrens bookshop down the street from our house in Sydney which had on sale several editions, one of which with colour plates done by Hoban’s wife Lillian. I sorely wish I’d bought one. I look forward to reading it to my daughter and will try not to crumble when after a long abscence, the mouse sets eyes on the elephant ‘he fell in love and prepared to meet his end’. It bothers me more that Q.2 starts with ‘what’ and not ‘which’. Years ago I might have put Patrick Bateman. This time I might say Richard Novak from This Book Can Save Your Life. Actually its Oliver Postgate’s Seeing Things. I remember rock journalist (see blog roll) being really sneery about this and shoving Phillip Roth paperbacks at me earnestly at the time. I loved that book and all the characters that he and Peter Firmin created. They were/are really special. I loved the Pingwings the most and even Shep likes Bagpuss. I am about to order and reread the Derek Tangye books which start with A Gull on the Roof, knowing that I’m definintely at that life stage where I want to abandon city life and grow things and get a goat. Shep has been earnestly hoping that one of the baby seagulls across the road will fall off and be abandoned so he can fetch it in and tame it. Actually on second thoughts it could well be Sue Townsend’s The Queen and I. Hilarious, warm and set in Leicester, the city whihc will always have a special place in my heart. The Jungle Book. I had an audio book of it read by Windsor Davies. I still love it but it began a lifetime hatred of all things Disney who just trash everything and miss the point. Chastise me if you like but I couldn’t get through Sophies World. My lovely phillosophy lecturer pushes it as a short history of everything but god it was boring. Probably the copy of This Book Can Save Your Life I bought in Oxfam. The surprse hit I couldn’t put down. Last year though it was without a doubt Urban Grimshaw and the Shed Crew (Bernard Hare). One of the ladies at the Service User and Carer group pressed it into my hands and implored me to read it as it was written by an Social Worker. She was right it was fanatastic and honest and sad. Later I looked him up and read some of his pieces for the Guardian (i think) which told the real fate of some of the characters in the book. In the present climate it might be The Bookseller of Kabul, or indeed Brave New World. But actually its The Odyssey – it covers all the bases! Not Yann Martel. He gave me nightmares. I’m With The Band (Pamela Des Barres) becauses its brilliant. Generally though books are trashed by being adapted. No more Dan Brown please. Its not real and its not literature ok? Its a toss up between Shakespeare and Chaucer because I think I love The Tempest and A Knights Tale equally. Kingsley’s Feste in Twelth Night might swing it though. Neither, I bloody hate them. When will there be good news? Kate Atkinson. A Piece of Cake, Cupcake Brown. I’m about to start Bluebird, Vesna Maric. Hey come on…I already mentioned The Bookseller of Kabul. I read stacks of things by the ‘marginalised’ – I’m a social worker! If its not in the ‘painful lives’ section at Waterstones it doesn’t count. I do draw the line at that Torey Hadyn woman though and that other one. Reasons to be cheerful part……oh who knows? 1. This is a birthday present from my friend. 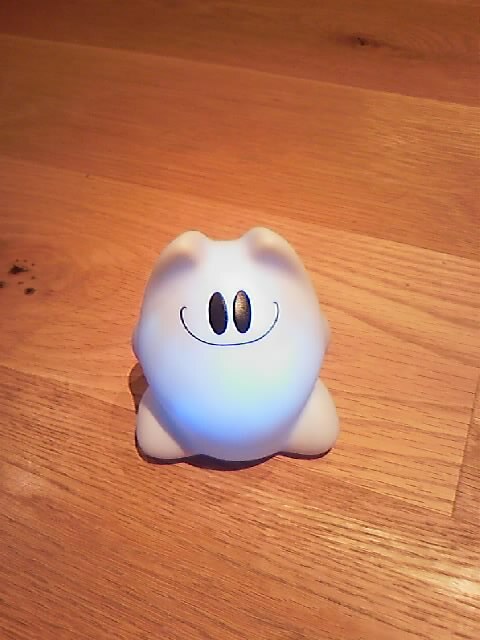 He is a Mood Beam.If you hit him on the head he lights up all different colours and flashes along to the music. This one is called Chipper apparently. 2. 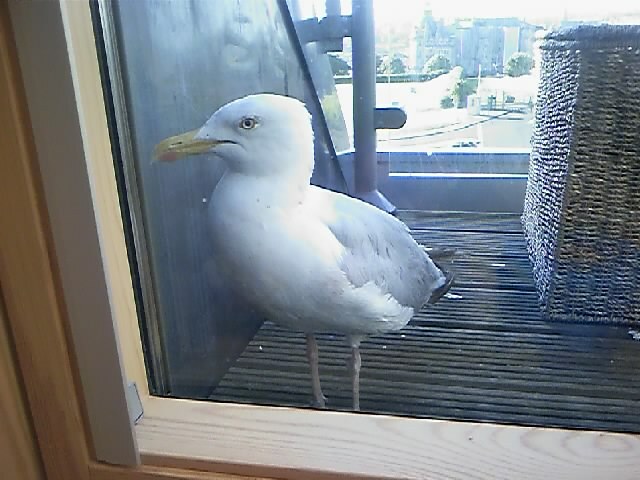 This is Mr Flappy, who got trapped on our back balcony. I called the RSPCA to come and rescue him. It was quite the drama. 3. I bought that £1.89 face cream from Aldi as seen on How to Look Good Naked. Its really very good!! I also bought ready made chocolate crispies from there which are well almost better than…….